Oil on panel, signed lower right. 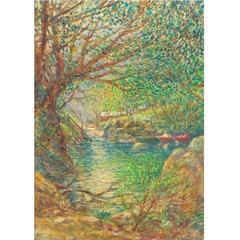 Lucien Neuquelman was an avid painter of French landscapes and Brittany coastal-seascapes. As a student at the Ecole des Beaux-Arts in Toulon he met Othon Friesz, whose pupil he would later become. In Paris he would attend the Academie de la Grande-Chaumiere and later still in 1930, he worked as a pattern designer for the Lyons silk trade. "Paris, Notre Dame" signed Antoine Blanchard l/r, signed A. Blanchard and titled on verso. Oil on canvas. Measuring 13 by 18 inches. 2014 pointillist architecture and plain painting by artist and actor Jordi Mollá. 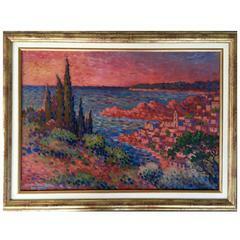 Dimensions without frame: 88 x 118 cm Dimensions with frame: 120 x 90 cm. Large acrylic on canvas pointillist style abstract painting by Isaac Holkar. Painted while at the Cavalry School in San Francisco, dated 1981. Signed by artist and date on back.